Japan AGMF stands for Assemblies of God Missionary Fellowship and is made up of AGWM (Assemblies of God World Missions) missionaries serving in Japan. There are 31 missionaries and all have been accounted for during this time. Give to JAPAN DISASTER RELIEF at the Assemblies of God website. From Monday to Wednesday, April 18-20, AGMF missionaries participated in a PTSD Seminar (Post Traumatic Syndrome Disorder) held by the Japan Assemblies of God and Central Bible College for about 80 pastors and church leaders involved in the Tohoku relief efforts. AGWM relief funds were used to provide housing for the guest speakers, Rev. 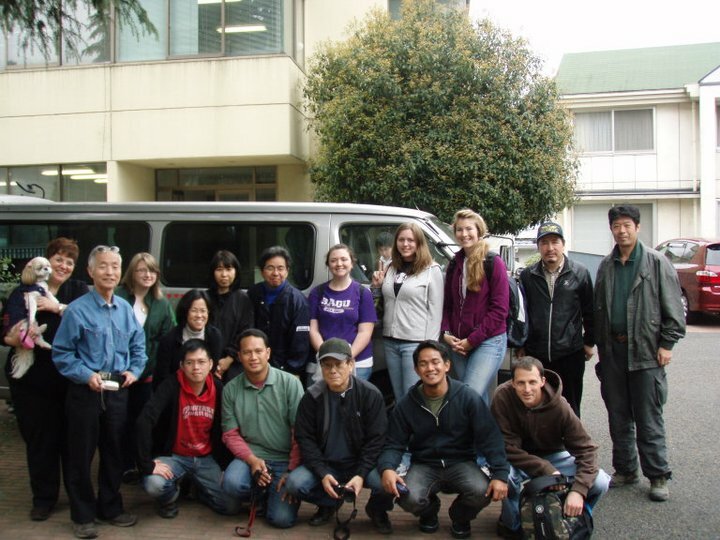 Nathan Davis, his wife Dr. Beth Davis, and Dr. Hiroshi Horikawa, as well as provide transportation and housing for four Tohoku area pastors and their families. For those who could not attend in person, the course was also made available via live Internet streaming. Nathan and Beth Davis are AGWM missionaries who travel to many nations conducting crisis intervention seminars with missionaries, national pastors, and even nationals. Rev. Nathan Davis:　The eldest son of US Assemblies of God missionaries Dr. and Mrs. Jim Davis, born and raised in Kobe, Japan. He served for 29 years in the Unite States Air Force as a psychologist. He leads practical training seminars on issues such as interpersonal relationships, crisis intervention, spiritual development, and stress management. In addition, he gives one on one counseling to over 50 missionaries a year. Nathan has a been recognized as a counselor by the International Critical Incident Stress Foundation（ICISF). Dr. Beth Davis:　She has worked as a missionary for over 25 years in Vietnam, the Philippines, Hong Kong and Belgium. She now serves as director of Caring Connection, an arm of the U.S. Assemblies of God which provides emotional care to missionaries around the world. Like her husband, she is also recognized by and is a member of ICISF. Dr. Hiroshi Horikawa：　Pastor Horikawa, who will oversee the interpretation of this seminar, is certified as a clinical psychologist studying at Hiroshima University School of Engineering, graduating from Central Bible College of Japan, studying at Vanguard University Graduate School, receiving a master’s degree from Fuller Theological Seminary and completing a doctorate (in clinical psychology) at Yasuda Lady’s University. He is currently the pastor of Mitaki Green Chapel (Hiroshima Christ Church) as well as contributing to the community as a chaplain and school counselor. The first relief team we coordinated through the AGMF (Assemblies of God Missionary Fellowship) is home and safe in Tokyo now. It was an awesome week (April 18-22). The six volunteers from Saipan are school teachers at an Assemblies of God Christian school. Five of them were from America and one from the Philippines. Also, one believer from ICA (International Christian Assembly) Tokyo, a doctor from Singapore went. One JAG pastor drove the van. Plus 3 AGMFers (Joyce, Amanda, and Shelley) completed the team. Two guys from Yokota ICA also joined a JAG pastor to drive a truck filled with water and suitcases. Another carload joined us for orientation and went to a different location. Bill and Carol Paris came up with another ICA Tokyo believer for one day to make a delivery of goods from Convoy of Hope. We received a great victory when we arrived back to the campus last night. I was told by the JAG Relief Committee Chairman that the team from Saipan did not have to pay to stay in the JAG lodge because they were here as volunteers! This is an awesome victory and will help us in the future as more teams arrive. We have many more registrations coming in and are now looking to send the next team up to the Sendai area during Golden Week. It costs nearly $600 in gas and tolls alone to make the roundtrip to Sendai. We always appreciate your prayers and support. Yesterday, Monday the 18th, we were able to take some relief supplies to one of our church member’s families who live in Rikuzen-Takada city in Iwate prefecture. In that area people have started to find new places to live and are leaving the evacuation centers which mean that their needs are different than before. Requests for cooking utensils such as pots and pans, kitchen knives, refrigerators, toaster ovens, hot pots, and rice cookers are common as well as bedding such as futons, blankets and pillows. So far, we have been able to distribute these types of goods at two different locations. Assuredly, more and more needs will become apparent. I would be thankful if you could pray for great financial blessings in order to buy these types of relief goods and pray that many would help to rebuild these survivor's lives. April 15. On Thursday the 14th, the warehouse portion of the JAG “Eastern Japan Disaster Relief Center” (the lodging area will open after the May holidays) opened! Pastor Funatsu of the JAG executive committee came to Sendai to sign the building’s rental contract and was accompanied by two Pastors from Convey of Hope who signed as witnesses. I would be grateful if you would rejoice with us over the opening of this warehouse by praying that through it we will be able to even more boldly be involved in the relief and recovery work. On Friday the 15th representatives from Kanazawa Christ Church, City Vision Glory Church, Evangel Family Church of Singapore, Shin Matsudo Revival Church, Izumi Fukuin Christ Church, and Convoy of Hope (totaling 30 people from 5 churches and one organization) came and ministered by removing mud and cleaning up in the Akai neighborhood of Higashi Matsushima city. Tomorrow we will continue with our 5th hot meal distribution as well as passing out relief goods, free haircuts given by the Teen Challenge group of Hachioji Christ Church, free baths and more mud removal. Please pray that the Lord’s work of healing, comfort and salvation would be upon the people in the disaster areas. Enter Acct# 891167-9 (48) in the comment section.